Steady Spin says its innovative new product is the perfect solution to stabilise all under counter, front-loading washing machines. 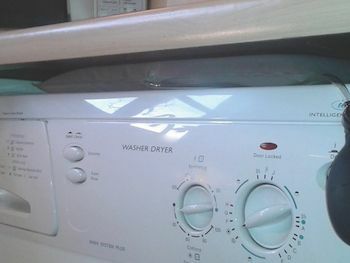 Users simply slip the inflatable pad between their washer/dryer machine and the counter top. Then they inflate with the handy manual pump to an optimum snug fit. Slide the pump to the top or side of the machine so it can't be seen. The appliance, now stable during the most ferocious spin cycles, absorbs energy and reduces noise while insuring no more movement or jumping for the whole wash. Your ears, floors, machine and neighbours will thank you for it! Trade prices are available, RRP is £12.95 inc. postage and packaging.